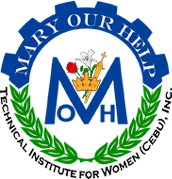 Mary Our Help- Technical Institute for Women is an institution committed to the nurturing and complete development of young women, for women, and by women with the guidance of Our Lady and the virtues and values by which everything is grounded on. Feel free to browse around and learn more! Thank You Sr. Mabel Pilar, FMA!